Let the Southern songstress inspire you with her tunes and lyrics as you pour out your own heart in this gorgeous journal for fans! Fill this beautifully designed journal with your inner thoughts and feelings, noting down special moments and setting out your hopes and dreams. 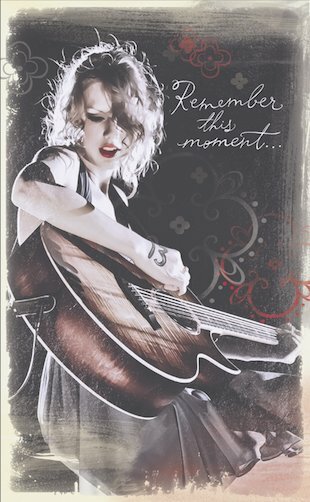 Follow in Taylor’s footsteps by creating your very own lyrics and jotting them down on the pages. Or collect your treasured secrets and most brilliant ideas in a special place where only you can see them. Whether you’ve got a Love Story or a Picture to Burn, be free to express yourself! Taylor Swift is is favourite singer so I really want to get this! I LOVE TAYLOR SWIFT SOOOOOOOOOOOOO MUCH SHE IS MY FAVE CELEB EVER! Huge Swifty! Is it just a notebook basically? i am her no.1 fan! i want it.